Cooler Master introduces a great value combination, case plus power supply with the Elite 350. 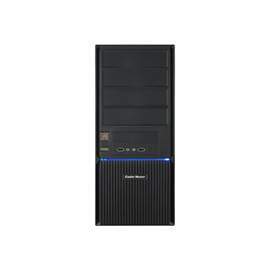 The mid tower case has a spacious interior, great for system upgrades. The superior airflow design with front, side and rear ventilation keeps the system running cool. It is powered with a quality 350W, 400W or 500W power supply, with life-time of 100,000 hrs and protection for OVP and OPP. •Includes 350W, 400W or 500W power supply. •Front panel with grill design for rugged look and excellent air intake. •Stylish front panel blue LED. •Front I/O panel for easy access. •Dual side ventilation for unsurpassed ventilation. •Rear 120mm fan provides excellent airflow.